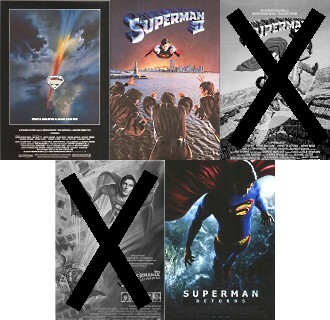 Despite the existence of posters, two of these movies were never made. Stradleyism: The act of dismissing an element of Canon altogether on grounds of it being "stupid", without taking the effort to do something interesting with it. As the Fanon Discontinuity trope shows, there are certain elements in Canon works that fans don't want to remember, because they're viewed as stupid, unpopular, or just plain don't make sense within that universe. If their complaints are loud enough, and if the writers agree, this can lead to the offending element being written out of Canon altogether. Sometimes the discontinuity is more subtle, such as a single line of dialogue or the specifics of an event. Besides those things, everything else is in Canon. When that happens they are treating it in Broad Strokes. Note that this trope has to do with the creators putting something out of continuity. For when fans do it, see Fanon Discontinuity. See also Continuity Reboot, Alternative Continuity, Broad Strokes, Disowned Adaptation. Old Shame works usually get this treatment. The opposite of Ret Canon and its descendant tropes. See Cutting Off the Branches for when all but one ending of a game with Multiple Endings become Discontinuity. If the writers lampshade a Discontinuity, either canonical or just something the fans want to be discontinued, then that's Discontinuity Nod. This page was last edited on 5 January 2019, at 22:47.